Staff working for Ecsite member organisations can publish news and events in their organisation's names in the "Members share" section of the Ecsite website, update their organisation's profile in the Members Directory and upload exhibitions on EXTRA, the marketplace for scientific touring exhibitions. Here is how to... also download the quick visual guide in attachment below. The Ecsite website works like many social media platforms: it relies on individual users. Everyone is welcome to create a personal account. If you belong to an Ecsite member organisation, you can then join that organisation's group using your personal account. Depending on the role you are given, you will have different degrees of permission to view and/or publish content in your organisation's name. Membership owner: same as previous + you are the person who created the group - you cannot leave the group before having granted this status to someone else (there always needs to be at least one person in each group). Once loged in, look for your organisation in the Members Directory, scroll down to the bottom of the page and click on "I work here". Your group's Membership manager will get an email asking them to approve your subscription and they will be able to assign you a role. Log in here (you can ask for a pass word reset). Once you are loged in, you see your user profile: if you are already a member of your organisation's group, in appears under "organisation" in the right hand side column. Don't belong to the group you should belong to? Look for your organisation in the Members Directory, scroll down to the bottom of the page and click on "I work here". And now... publish and manage away! You have all freedom to create news and events, attach pictures and files to them etc. If you’re not quite ready to publish an item, click "save as draft" at the very bottom of the page. 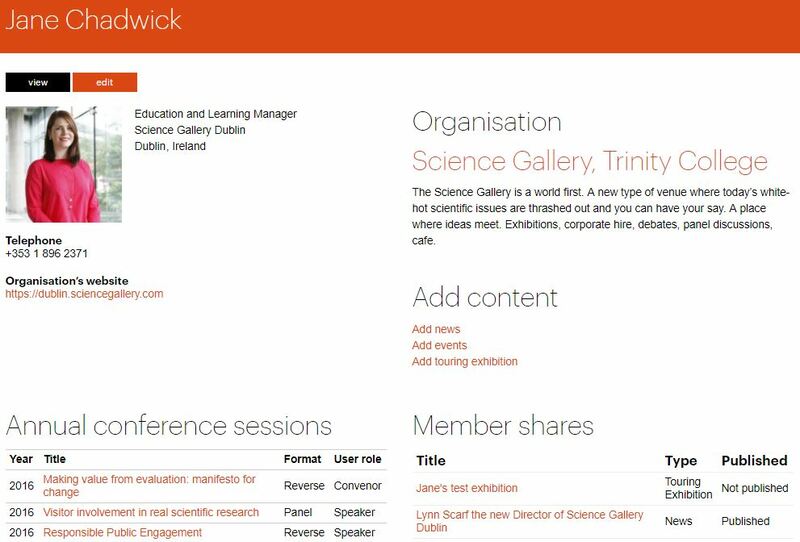 Your item will be listed on your profile page, under "Member shares"
Now that you're logged in you can edit your organisation's public page, review articles published and add people to your group, remove them or change their permissions. When you edit your organisation's public page, don't be surprised if you're taken back to a form that looks like the application you filled in to become a member: this is where the system pulls information from - don't worry, you don't have to apply for membership again! Click on "invite people": you can now enter the person's email address and choose the role they will have in the group. They will receive an email to create the corresponding account. Follow the same steps as in the previous paragraph, except for the final operation: click "add user". To do that you need to know your colleague's user name. After logging onto the platform with your usual account, you'll be able to access your organisation's account, to manage its host settings, get a summary of your colleagues' visits etc. Because accounts are personal, the system has an issue with a single email being linked to two or more accounts. If this is the case, you will experience issues when trying to save changes to your profile. Contact Mariette (below) to sort out this double identity issue! Mariette Wennmacher at info@ecsite.eu is here to help!